[HOT TOPICS] Thank you so much!! 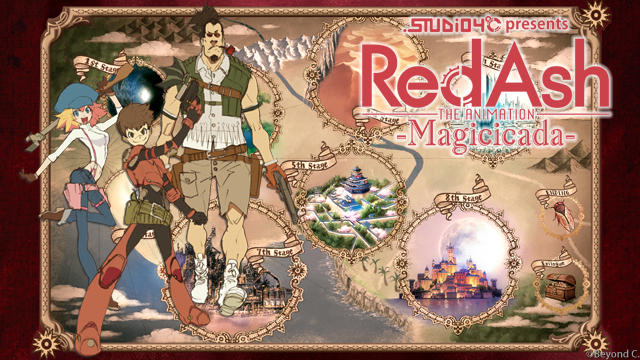 The fundraising project for Red Ash THE ANIMATION –Magicicada– was started on July 4th on KICKSTARTER and successfully funded on August 4th, $162,882 pledged for $150,000 goal. With the success on the Kickstarter, production of Red Ash THE ANIMATION –Magicicada– is officially confirmed. To extend runtime of the animation, we have opened further fundraising through “STUDIO4℃FUN&”! When we reach the goal of either STUDIO4℃FUN& ($127,118) or Motion Gallery ($120,000), STUDIO4℃ confirms the production of 2nd stage. (In case the total amount does not reach $260,000 by the end of the two campaigns on 14th Oct., STUDIO4℃ will try and secure budget for the shortage.) We will go for the next 3rd goal when total $260,000 is funded. In case both platforms fail to reach the goal, raised fund will still be used to create animation, in proportion to the amount of fund, such as extending runtime, making spin-off story of the main characters, or creating opening animation. You will receive your returns regardless of the result of the campaigns. Join and support the very first crowdfunding project of STUDIO4℃! The main characters will explore separate unique worlds and stories in the animation and game created by two production teams with full creative freedom. STUDIO4℃, a creative studio consistently producing high quality video works and highly acclaimed worldwide with its distinctive outputs. comcept, a creative team led by Keiji Inafune, a man involved in the creation of countless hit games as a creator at Capcom. The two entities will unleash their creative powers, with Red Ash as the common theme. “Red Ash THE ANIMATION” is envisioned as a fast-paced, entertaining film in which unique characters explore various stages. We call it a “treasure-hunting animation.” Progressive stages of the adventure will be created by STUDIO4℃ creators, artists whom we wish to collaborate with, and young up-and-coming talents. The idea is to incorporate different worldviews by bringing together creators of diverse talents to develop each new stage of the adventure. The ultimate vision is to produce a movie involving dozens of talented creators! We need your support to create a movie filled with gimmicks, riddles, secrets and conspiracies that will keep you on the edge of your seat! It is an innovative entertainment concept brought to you by STUDIO4℃, the creative studio of the groundbreaking “Genius Party” anthology! They say that pushing the wrong button will cause “them” to awaken and emerge from underground. Is the map grandpa gave to Beck a treasure map? Or a landmine map? Intrigued by the mysterious code, Beck and his best friend Deny continue to dig caves in search of hidden treasure. But the friends end up parting ways and competing for the treasure. The meaning of a cue from a spring-driven computer ...? As the action-filled treasure hunt evolves, Call and Tyger befriend Beck. Different mysteries and items appear at each new stage of the saga. The imaginations of the creators behind the stories run wild! The top creators of STUDIO 4℃ are developing an unprecedented 3D animation experience! First of all, we try to reach the initial goal to the first 12 min episode. Every time we reach a new stretch goal, additional stage (minute) will be added to the story. Animation production requires meticulous preparation and development. By building the story step by step, the level of excitement and quality of each stage will be well improved. Talented creators will participate in each new stage, bringing their unique worldviews, characters, mecha designs, weapons, props, puzzle schemes and music to the project. The story unfolds as the main characters travel through various stages. How many artists will participate in the work? How will the story turn out? It’s all up to YOU, the backers of this project! If our ultimate goal of $2,480,000 is achieved, the project will culminate in the production of a feature film. We hope everyone to watch the animation on a big screen! Also the film will be applied to international film festivals for competition. Achievement of “stretch goals” will determine how many stages will be created and eventually WHO will participate in the project. Final confirmation will depend on creators’ schedules, but we are open to your requests! Tell us whom you want to be involved in the project! Talented, young CGI creator Yuta Sano will take the helm as director of RED ASH THE ANIMATION. In his directorial debut, Sano will challenge himself in this new form of expression. I plan to create all characters in 3D models in Red Ash THE ANIMATION. Instead of using cel shader, I’m developing the models in the style of illustration in order to mix the excellent essence of 2D painting with 3D's solid image. As for motion, I want to combine fluent 3D animation moves and Japanese hand-drawn animation techniques. Expressions such as changing a character’s perspective in a motion or dynamic character deformations are some of typical techniques in Japanese animation, which are considered to be difficult to adopt in 3D. We would like to take on the challenge of developing those difficult expressions in 3D on this project. STUDIO4℃ is putting everything to create this new form of Japanese animation. Please support Red Ash THE ANIMATION –Magicicada– ! Feel free to ask any questions via email: fun-and@studio4c.jp. STUDIO4℃ is a creative studio consistently producing high-quality film and video work. Its distinctive outputs traverse genre and are highly acclaimed worldwide. ★Awarded at film festivals in Belgium, Italy, Spain, and Canada. ★Fantasia International Film Festival: Received 6 Awards, including "Best Film Award"
The materials presented here are still under development. The designs and duration of stages are subject to change. Depending on the amount of funds raised, overall duration may also change, and completion of the project may be delayed. Production of theatrical film will be contingent upon achievement of the final stretch goal. Q：Is Red Ash -Magicicada- a movie, tv series, or a game? A：Red Ash -Magicicada- is an animation movie. It starts as a short movie, and every time we meet a stretch goal, a new stage (more duration) will be added to the story. We hope to make it as a theatrical movie (about 90 min), and it will happen when we reach the final goal! Q：What is the language of dialogue? Which subtitles will there be? A：The animation will be in Japanese dialogue with English subs. We are also discussing about subs and dubs in other languages. Q：Why are there differences between the Animation and the Game such as the skin color of Call and etc.? A：Animation and Game are parallel worlds and each worldviews are very different. There are differences in character designs, color designs, voice actors and more. We hope you enjoy the two worlds! Q：What rating do you plan for Red Ash THE ANIMATION? A：Our plan is General. We want everyone to watch our film! Q：If the project does not reach the final goal, will the animation be incomplete? A：The animation will be a short movie if the project does not reach the final goal. The story changes depending on how many goals we clear and how long the duration will be, but the animation won't be incomplete! The campaign will end on 14th October 2015 at 9:00 PM JST. All pledges from supporters will be charged and go to the project fund instantly. This tier is for backers from Kickstarter. You can upgrade your pledge by adding difference amount here! ・Make sure to sign up to STUDIO4℃FUN& with the same email address you used for the Kickstarter. ・If you upgrade from an only digital reward to a physical reward, and need items to be shipped somewhere other than the USA or JAPAN, make sure to add shipping charge ($17) to your pledge. *If you have any questions, feel free to ask us via email: fun-and@studio4c.jp! * This Return is only for the calendar and does NOT include other items. Also, this item is limited to this tier and is NOT included in any other tier. * Shipping cost $10 (anywhere in the world) is included. Special Thanks Message from Creative Team! +A VOTING RIGHT for "VOICE ACTOR CASTING" of CALL and TYGER. Includes everything from returns above . Includes everything from returns above. *V CONTE is a shortened form of Japanese word "Video Continuity" or "Visual Continuity." It is usually a composite movie of storyboards made in actual duration and with some camerawork. ※We will deliver Blu-ray prior to digital downloads. You will be the first to watch the whole animation story! Includes everything from returns above EXCEPT T-shirt and Blu-ray. Includes everything in Return #8 tier and above. *The image is a sample design from our past collaboration with JHA. A STUDIO4℃ creator will design a brand-new watch for Red Ash -Magicicada-! Delivary date might be delayed in case we receive many many requests. Includes everything from returns above except for limited items. + Master Audio Tour in Tokyo! Master Audio = MA is an audio post production process to create the final audio of the animation film by synchronizing music, sound effects and dialogue. STUDIO4℃ will invite you to a Master Audio Tour, which will be held in Tokyo! You will be able to watch the process of the film getting completed and meet with the director, producer, and the audio mixer. *You will be notified the date of the Master Audio Tour later, and those who can show up on that date will be able to join the MA. Transportation and accommodation fees are not included. + 3D PRINT CHARACTER FIGURE of BECK. One and only chace to get the exclusive character figure of Beck! *The image is a sample design. A STUDIO4℃ CGI artist will design the character figure. + 3D PRINT CHARACTER FIGURE of TYGER!! Limited production of 5 in the world. Get the exclusive character figure of Tyger! *The image on the campaign page is a sample design and subject to change. A STUDIO4℃ CGI artist will design the character figure. + 3D PRINT CHARACTER FIGURE of the Stage Heroine!! Get the exclusive character figure of the Stage Heroine!! + 3D PRINT CHARACTER FIGURE of DENY!! Get the exclusive character figure of DENY! + 3D PRINT DELUXE FIGURINE of BECK, CALL, and TYGER!! All three characters in one bigger figurine. *Design will be created based on the imageboard of "the three on a vehicle together." (See the Image Board section on the project page) Supporters' exclusive item and limited production of 44 in the world. *STUDIO4℃ covers flight tickets to Japan and 1 night accommodation! + Q&A SKYPE MEETING with the Producer (Tanaka-san) and the Director (Sano-san)! With You and the main staffs, the meeting will be held only for you. One of the very few chances to talk with them personally and ask questions about animation production! *The main staffs are Japanese speakers. You will be required to use Skype to attend the meeting. In-house study seminars are held every year from April to June for new employees. We invite guests who are specialized in a certain part of animation production once a week. Come join us to listen to backside stories of anime production! Schedule for 2016: Once a week on weekdays, 10:00 a.m.-12:00 p.m. We will inform detailed schedule before April 2016. You will be asked to take a pick of a convenient date to join a seminar. * You can attend a senimar once. * Please be informed that guests will speak in Japanese and that transportation and accommodation fees are not included.